Like an anonymous person once said, motherhood is the only place you can experience heaven and hell at the same time. Being a mother is quite the tough gig but amid the challenges, there are shining moments of joy and satisfaction. 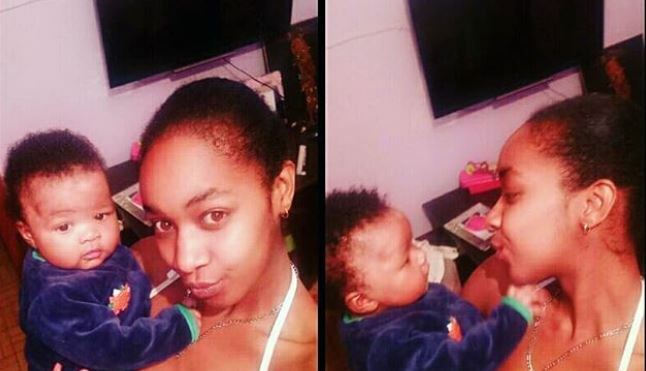 One mother who seems to be taking parenting in her stride is the once-controversial Nairobi girl-about-town Vanessa ‘Chettle’ Cheruto. At barely 22 years of age, the former model and Nairobi Diaries actress reportedly delivered her baby girl, Anna Chebet Chettle, on her own inside a bathroom. In addition to all that, the petite beauty is also having to raise Anna as a single mother because her baby daddy bailed out. “I met him in Eldoret last year and a­fter three months, I got pregnant. When I broke the news, he started behaving weird and we broke up. He has not helped me financially or emotionally. We have never talked. But I know he can afford to chip in with the expenses,” said Vanessa in a recent interview. “God instructs us to forgive, so I will, but I will not take him back. I will allow him to bond with and provide for his child,” she added. However, despite all the challenges, Vanessa is still trying to be the mother she can be if her social media is anything to go by. Over the weekend, she penned a profound and perceptive letter to five-month-old Anna with wise teachings on Family, Friends, and God. In this life, tomorrow is not promised so I write u this letter hoping it can guide you once you begin to learn about rights & wrongs. FAMILY- I have introduced you to the entire family, these are your people but be fooled not because even though blood is thicker than water, betrayal from them will burn u bitterly. Respect is all I can advise you to have, do not depend on them 100%. Chances are they won’t come thru for you like you’d expect ‘blood’ to. Know your people, love your people, help your people but do not lose yourself amongst your people. Only funerals, weddings & babies temporarily bring these people together. You are just but your parents’ burden… stand alone & be strong! FRIENDS- They come & go. The realest ones in life you will only know after a long time, this will be after overcoming many obstacles that life throws, fights, growing up, growing apart, reconnecting, emotions, disappointments, distance etc. It’ll take time & lessons but you’ll make one or two good ones in your lifetime. So don’t be quick to share your secrets or declare “BFF”. LOVE- First of all u are free to love freely be it a boy or a girl. The boys love to play games, So don’t be too Eazy to get & don’t try too hard to impress them either. Girls are trouble, if you decide to date one be smart bcoz as a female yourself u are aware of just how cunning we can be! Think like a woman, but understand the mind of a man too. In short, #SelfLove comes first & the rest can follow. If anyone breaks your heart Mamas gonna break their neck! GOD- I believe in a higher deity than all of us humans. I believe in angels too & I believe you are mine specially sent. Faith can move mountains despite life’s difficulties we sleep better knowing there’s a higher being watching over, guiding us & taking care of tomorrow & the unknown. So if you choose to believe, believe in God. And do good because it comes back around (Karma). DON’Ts – Don’t ever think looks are everything, you gotta be beautiful from inside out. Don’t put all focus on education & money. Live life, take risks & explore & gain wisdom & knowledge through mistakes & experience. Dear sweet Daughter of mine, In this life tomorrow is not promised so I write u this letter hoping it can guide you once you begin to learn about rights & wrongs. FAMILY- I have introduced you to the entire family,these are your people but be fooled not because even though blood is thicker than water,betrayal from them will burn u bitterly. Respect is all I can advise you to have,do not depend on them 100% chances are they won’t come thru for you like you’d expect ‘blood’ to. Know your people, love your people, help your people but do not lose yourself amongst your people. Only funerals, weddings & babies temporarily bring these people together. You are just but your parents burden,stand alone & be strong! FRIENDS- They come & go. The realest ones in life you will only know after a long time,this will be after overcoming many obstacles that life throws, fights ,growing up, growing apart, reconnecting, emotions, disappointments, distance etc. It’ll take time & lessons but you’ll make one or two good ones in your lifetime. So don’t be quick to share your secrets or declare “BFF”. LOVE- First of all u are free to love freely be it boy or girl. The boys love to play games,So don’t be too Eazy to get & don’t try too hard to impress them either. Girls are trouble,if you decide to date one be smart bcoz as a female yourself u are aware of just how cunning we can be! Think like a woman, but understand the mind of a man too. In short #SelfLove comes first & the rest can follow. If anyone breaks your heart Mamas gonna break their neck! GOD- I believe in a higher deity than all of us humans. I believe in angels too & I believe you are mine specially sent. Faith can move mountains despite life’s difficulties we sleep better knowing there’s a higher being watching over,guiding us & taking care of tomorrow & the unknown. So if you choose to believe, believe in God. And do good because it comes back around (Karma). DON’Ts – Don’t ever think looks are everything,you gotta be beautiful from inside out. Don’t put all focus on education & money. Live life,take risks & explore & gain wisdom & knowledge through mistakes & experience. Lastly DON’T u ever doubt that I LOVE YOU!